CRAMMED into this year’s field of 10 best picture Oscar nominees are British aristocrats, Volvo-driving Los Angeles lesbians, a flock of swans, a gaggle of Harvard computer geeks, clans of Massachusetts fighters and Missouri meth dealers, as well as 19th-century bounty hunters, dream detectives and animated toys. It’s a fairly diverse selection in terms of genre, topic, sensibility, style and ambition. But it’s also more racially homogenous — more white — than the 10 films that were up for best picture in 1940, when Hattie McDaniel became the first black American to win an Oscar for her role as Mammy in “Gone With the Wind.” In view of recent history the whiteness of the 2011 Academy Awards is a little blinding. 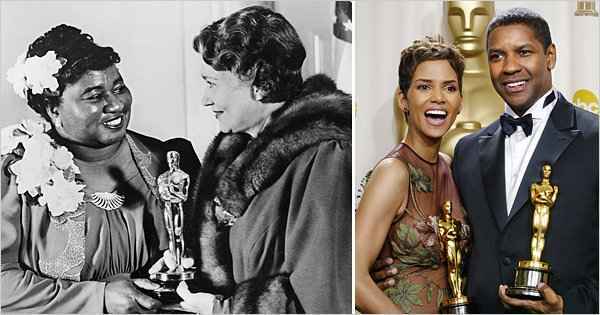 Nine years ago, when Denzel Washington and Halle Berry won his and her Oscars — he was only the second African-American man to win best actor, and she was the first African-American woman to win best actress — each took a moment to look back at the performers from earlier generations who had struggled against prejudice and fought to claim the recognition too often denied them. Real change seemed to have come to movies or at least the Academy, which had given statuettes to a total of seven black actors in the previous 73 years. After Mr. Washington and Ms. Berry, there would be Jamie Foxx and Forest Whitaker (both best actors); Morgan Freeman (best supporting actor); Jennifer Hudson and Mo’Nique (best supporting actresses). The consolidation of a black presence in the movies and television did not signal the arrival of a postracial Hollywood any more than the election of Barack Obama in 2008 spelled the end of America’s 400-year-old racial drama. But it was possible, over much of the past decade, to believe that a few of the old demons of suspicion and exclusion might finally be laid to rest.